12 Days to a Merry Holiday! We’ve teamed up with 5ive 15ifteen Photo Company & Graydon Hall for our version of the “12 Days of Christmas” - from unique gift-wrapping ideas, to DIY holiday decor, beauty, and everything in between- this is the ultimate guide to helping you plan and orchestrate a stress-free (and fabulous) holiday. DAY 1: Get festive and adorn your home in style with a DIY feather wreath! Using ordinary materials, you can make something extra ordinary. Below is an easy, step-by-step process to make this chic wreath! 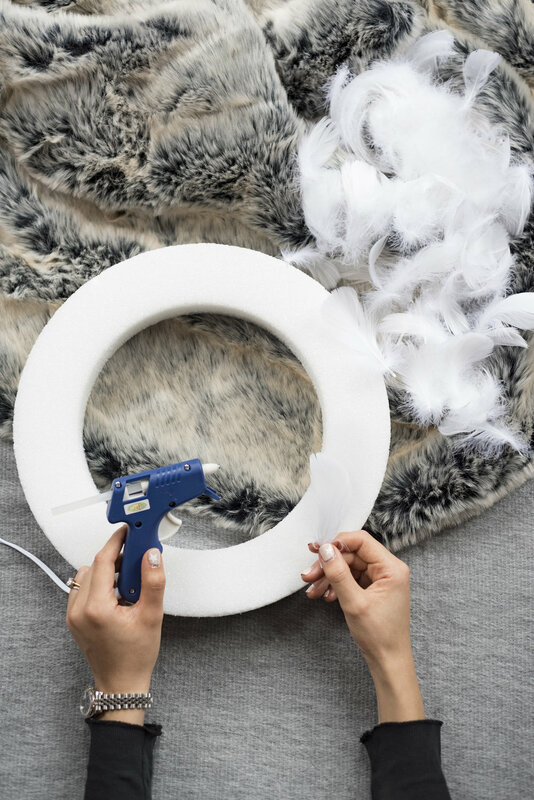 All you need is a Styrofoam wreath form, white feathers, glue gun and a steady hand! DAY 2: ‘Tis the season for holiday work parties! For that daytime soiree, go with the dewy look that gives your skin an angelic glow and radiant complexion. 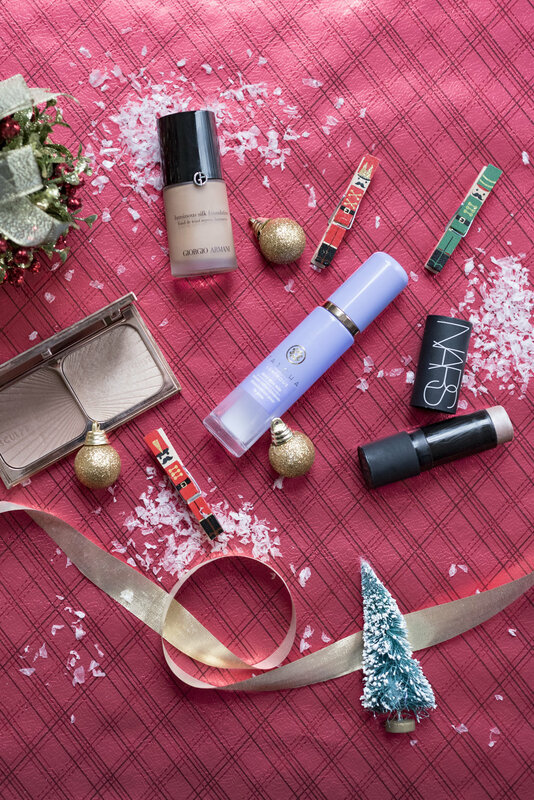 DAY 3: Gifts for her - Get her what she really wants! DAY 4: Gifts for him! DAY 5: Green with Envy! With all the Holiday parties, it is the perfect time to be a little extra, especially on your eyes. Fading copper into deep green is a moodier and updated version of the traditional smokey eye. DAY 6: Up Your Gift-Wrapping Game! Elevate your holiday presents with unique gift-wrapping ideas. Upgrade plain paper with natural elements; think beyond the basic bow; and make it personal with a monogram tag. DAY 7: Keeping the Kids Entertained! Create a playful, fun and festive setting just for the kids to excite their imaginations and encourage creativity! A full-sized colouring table is the perfect trick, paired with snacks and of course, Santa hats. This will surely keep the little ones entertained! DAY 8: Jazz up Your Holiday Table! The holidays begin and end at the table, so style it right! This elegant holiday table idea is sure to dazzle your guests (and is easy to do). 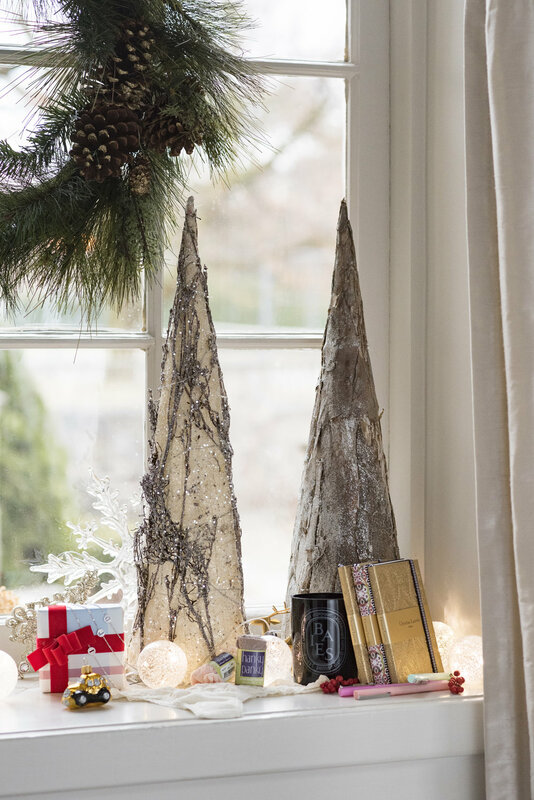 Mixed mini trees add for some interest; fresh garland and twinkle lights are sure to delight. 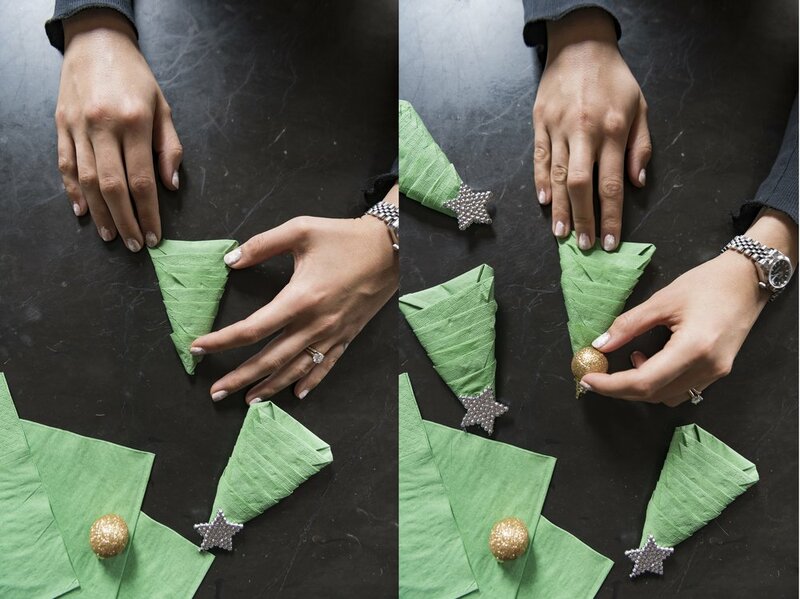 Tip: using ornaments is an easy way to add some festive cheer to the table! 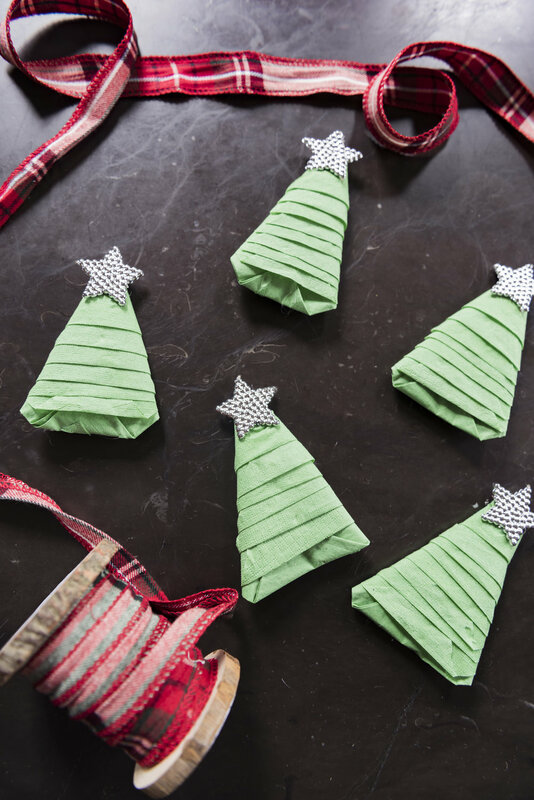 DAY 9: DIY Tree Napkin! DAY 10: Use Desserts as Decor! Deck the halls with frosting and sugar! An impressive dessert will not only be delicious, but an easy and unexpected way to spruce up your holiday table. Give your meal a show stopping finish that will almost be too pretty to eat. 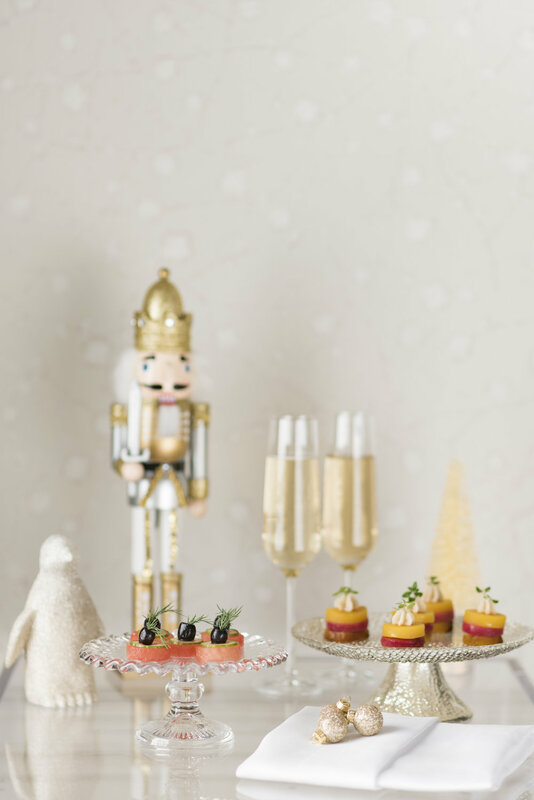 DAY 11: A Party is Never Complete without a Delicious Selection of Hors D’oeuvres! French onion soup, in mini lion head bowl. Holiday hosting tips: cut out little rounds of brioche topped with grated Gruyere, and broil in oven for a quick melt. DAY 12: What are the Holidays without Cocktails? Serving the perfect holiday concoctions will keep your guests cozy and warm, and the party going. These vegan duos pair beautifully with a crisp French Champagne.